This Instant Pot Barbecue Chicken Thighs Recipe is coated in a delicious BBQ Root Beer sauce that everyone will go crazy for! Add ¼ cup Root Beer to bottom of Instant Pot, then place Chicken Thighs in the Instant Pot. In medium mixing bowl, combine ¾ cup Root Beer with 18 ounces of Barbecue Sauce. Set ¾ cup of the BBQ/Root Beer sauce mixture aside to drizzle on your cooked chicken once it's done. Pour remaining sauce mixture from bowl over Chicken Thighs and secure lid on Instant Pot. Select “Meat/Stew” setting, select “High Pressure,” and change cooking time to 15 minutes. Serve as whole thighs, or shred with 2 forks and serve on a bun as a sandwich or sliders. 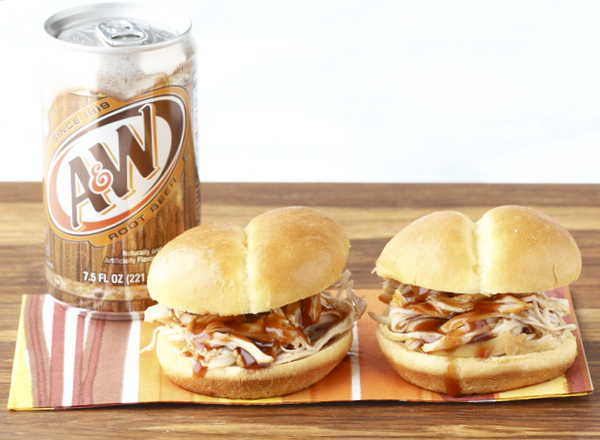 Drizzle the ¾ cup of sauce you had set aside over chicken on your plate or bun, and ENJOY! *If using a Crock Pot Pressure Cooker, select the "Beans/Chili" setting to manually override cook time and pressure settings.